FROM THE SOUTH WEST CORRESPONDENT….. Wondered if you might be interested in this at all…. I’ve just had a recent trip home to Kent and as I was leaving my old dad said to me – as you are here you may as well take that box with you. What box I said. That one over there its full of your old cd’s you left it here in 1998. 1998! Sweet Jesus. Built To Spill ‘Car’ – A single from 1995. Which isn’t that bad a start to be honest although I dread to think what else may be inside here. Built To Spill were according to Wikipedia formed in 1992 by Doug Martsch, Brett Nelson and Ralf Youtz. Martsch was the leader of the band and said that he would change the line up of the band for each album they make. Which adds him to my growing list of Rock stars who think that they genocidial dictators. Sadly I don’t think he was good to his word as in 2013 – Brett Nelson is still with the band. No idea what happened to Ralf Youtz though. The song appears on the City Slang Album ‘There’s Nothing Wrong with Love’ which was released in 1994 and like a lot of America Indie rock from that time it sounds a bit like Pavement, a bit like Sonic Youth and a bit like Dinosaur Jr, or maybe that’s just my lazy thoughts, although Martsch does site Dinosaur Jr, Pavement and Camper van Beethoven as strong influences. Modern bands such as the Strokes and the god awful Death Cab for Cutie list Built To Spill and as influence to them. But don’t let that put you off. Matt Groening inventor of the watchable cartoon loves them and that’s a good thing. 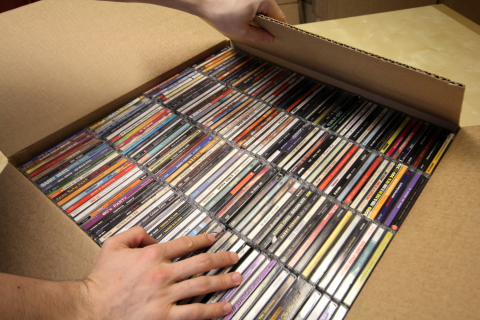 So the first CD, relatively well known American lo fi indie act – if I remember myself from 1998 correctly I would have boxed up my CDs in alphabetical order (we all do it, stop guffawing) – so anyone want to guess what might be up next…. JC – I’ll do the next CD next week. Let me know if you want me to continue. Don’t know about the rest of you, but I’m intrigued by what else might well be in this particular box. This was something completely new to me and SF is spot on with the description of it being atypical mid-90s American indie rock but that’s not necessarily a bad thing. Keep em coming SF.